It may look like church business as usual today as 300 delegates discuss programs, finances, resolutions and elections in the second day of a statewide convention. But the event at St. Andrew's Cathedral is an historical one. Local Lutheran and Episcopal church members began meeting in joint sessions yesterday, seeking to put into grass roots practice what their national organizations preach. 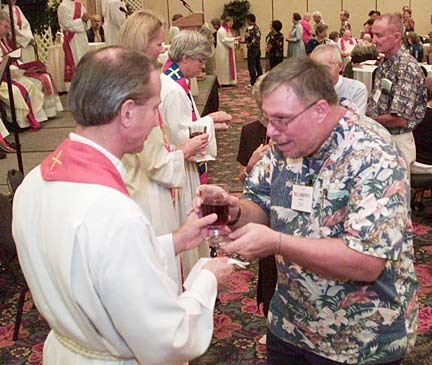 The Churchwide Assembly of the Evangelical Lutheran Church in America approved a document calling for "full communion" with the Episcopal Church in 1999. The General Convention of the Episcopal Church in the United States approved the proposal "Called to Common Mission" in July 2000. The votes came after 30 years of talks between the American branches of the two mainline denominations which have operated as separate branches of Christianity since the 16th century Protestant Reformation. "We're trying to bring it home to Hawaii, not only understand it but experience it," said Eileen Ward, lay chairwoman of the Lutherans' Hukilau Conference at which eight island churches are conducting a regular fall meeting. "This is not a step toward a combined church," said Honolulu Episcopal Bishop Richard S.O. Chang. "Inter-communion means we can share clergy, ministries, sacraments." He and delegates from 40 Episcopal congregations are holding their annual meeting. "What this does is make a statement that we are in this together," said the Rev. Fred Sapp, pastor of Holy Trinity Lutheran Church in Kona. It is the combined sessions that had everyone excited. The overlapping conventions opened with a communion service yesterday at which Chang presided and Lutheran Bishop Murray Finck of Los Angeles, head of the Pacifica Synod, spoke. The day's events at the Ilikai Hotel included afternoon workshops where the mixed membership brainstormed about projects and ministries that can be shared. At a banquet last night, outstanding volunteers from both denominations were honored. Sapp lead the joint morning prayer service today at the downtown Episcopal cathedral. The separate conventions continued in Tenney Theater and Davies Hall. "Anything is possible" at the roundtable discussions, said Ward. She expected shared youth ministries and evangelizing to be areas "where we can learn from each other's work." The idea of cooperating on programs isn't brand new. Chang pointed to the Lihue, Kauai, congregations of St. Michael and All Saints Episcopal Church and Lihue Lutheran Church which have produced a joint Advent study program for the past few years, featuring a prayer book with parishioners' contributions. "Hawaii often takes a lead and is looked to as an example," Ward said. "So we have done some things we are quite proud of and we are always looking for new ideas." Chang said an example of the opportunities made possible by the "inter-communion" is an application from a Lutheran minister seeking a part-time job in an Episcopal church. "This was not possible before," said Chang. It would be a perfect, practical solution for two small churches, neither of which can afford to pay a full-time pastor, to share the expense of one, he said. "In the past if a Lutheran pastor came to participate at an event in an Episcopal church, he would need to use a Lutheran prayerbook," said the Episcopal bishop. Sapp said there are a lot of areas "where we can support each other rather than be in competition." He said the Evangelical Lutheran Church in America has approved statements of "full communion" with other denominations including the Presbyterian Church (U.S.A.) and the United Church of Christ. The relationship is not approved by everyone, Sapp acknowledged. "I can't think of any issue that someone is not going to buy into it. It's not a significant situation, I don't see that it would interfere with a ministry. "Our basic theology is out of the same Reformation mold, is pretty much the same," Sapp said. They diverged on "different formulas for church organization." Chang said that a stumbling block during the national discussions was the differing views of the church selection of its hierarchy. Some Lutherans balked at the Episcopal concept of an "historic episcopate" in which each bishop is ordained by a bishop and can trace the time line back to the early church. "I'm number 971 since the first bishop in America, Samuel Seabury. To many Episcopalians, that is a big deal." Lutherans elect their bishops for a fixed term, believing that the Gospel established apostolic succession. Lutheran pastors may be ordained by a bishop, or by another pastor. "Our focus at this level is not on the theology, but on how we do as people in obedience to the commands of Jesus," said Chang.